12-inch tall action figure of David Tennant as 10th Doctor. Inspired by the BBC TV series Doctor Who. In a cloth costume, the Doctor brings signature accessories like his Sonic Screwdriver and the Psychic Paper! From series four of the BBC's hit series Doctor Who, BIG Chief Studios recreates the Doctor in impressive detail! Featuring a detailed head sculpt of actor David Tennant as the formidable Tenth Doctor, with over 30 points of articulation, the figure sports a blue pinstriped suit, with maroon shirt and patterned tie, socks, boots, and his trademark trench coat. 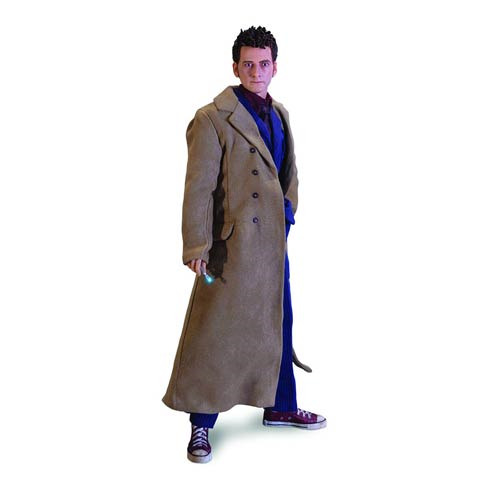 Packed with accessories, including the Doctor's trusty Sonic Screwdriver, Psychic Paper, and 3-D glasses, the Doctor Who 10th Doctor Series 4 1:6 Scale Action Figure stands approximately 12-inches tall. Limited to 2,000 pieces. Ages 15 and up.